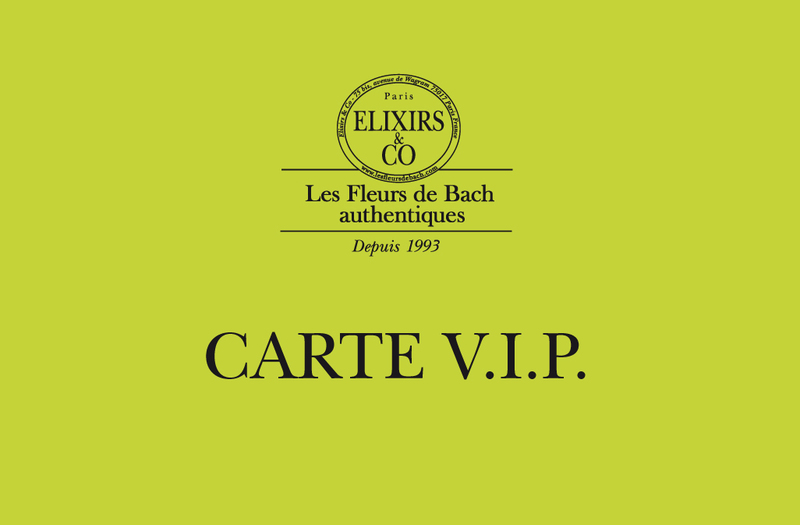 With the V.I.P card, get into the world of Bach flower essences by Elixirs & Co for a whole year! A paying card that allows you to access extraordinary advantages and enjoy Bach flowers easily. More than a loyalty program, you benefit from real privileges throughout your subscription year. Thanks to the V.I.P card, we give you access to exclusive benefits available on internet and in our shops! - Your shipping costs are free from 60 € instead of 150 €. Only available in Metropolitan France. - A PERMANENT 15% discount on all your purchases and this, throughout the year! - A birthday gift : a voucher of 20€ according to your V.I.P status valid on every items on the website. It can be used during the 30 days following your birthday. - Access V.I.P to the well-being place in our boutique des Batignolles in Paris. It is only valid for a single user and can not be used by a third party. Becareful : people who paid the VIP Card before the 1st february 2018 benefit of the previous advantages!